If you are new to our site and you have not much experience with SharePoint and/or its workflows, this is the perfect starting point. 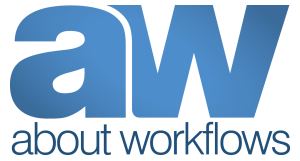 We will use a sample company to explain the terms "process" and "workflow" show you how much sense workflows make! Imagine you own a company with 1001 employees. It is holiday season and 1000 people come to you and ask if they could go on holidays. So you tell everybody to fill in a form and give this form not to you but their direct manager. If the holiday request is approved, tell them to make an entry in the company's holiday calendar so everybody knows about it. What you just did was to describe the process of the "holiday request". After the holiday season ends, you notice that you didn't do anything the last month but describing your "holiday request" process. So you decide to write it down and publish it on your SharePoint Server. Since you are a smart person you use Visio to visualize it and Visio Services to publish the diagram. That way people don't need to install Visio on their client. You think that this is quite a good way to handle your processes and you describe most of your processes that way. But then something unpleasant happens. You schedule a meeting with Johnny (That's your expert for everything), yourself and a customer (a big deal $$$). A few days later Johnny tells you that he is on holidays that date - he forgot to make an entry in the calendar. You think this shouldn't have happened and you are thinking of automating that process. That's when the workflow comes in. So we automate a process and we call that workflow. We use InfoPath to design a browser form and we use the SharePoint workflow engine to involve people and do automated tasks like add an entry to our calendar. I hope that was a good example to show the relationship of processes and workflows. Please also note that it doesn't make sense to automate every process. Choose easy to automate processes that are often used! The next part of this series will describe how to publish processes with Visio Services on SharePoint.